This year, from 13 – 15 June, the event again focused on the area of Seine-Saint-Denis, bordering on the 19th arrondissement of Paris, close to the CentQuatre, where the ESDC, and the Futur en Seine festival will take place. Traditionally a heavily industrial and multi-cultural area, with large numbers of immigrant workers and a dense population, Seine-Saint-Denis La Plaine, and its neighbouring areas on the border of Paris and its suburbs are now being redesigned and developed within the “Grand Paris” project. In addition to its strategic position, the area also has significant infrastructure potential, for example, the revitalization of a good canal network, and re-use of disused railways lines. Many of the old canal warehouses are now being used for creative work, and the building of a new university also offers the opportunity for interesting housing development. Despite present development, there are still many social, cultural and economic challenges. One challenge, for example, is to maintain a strong, vibrant urban identity, while creating a new urban vision and sustainable quality of life. 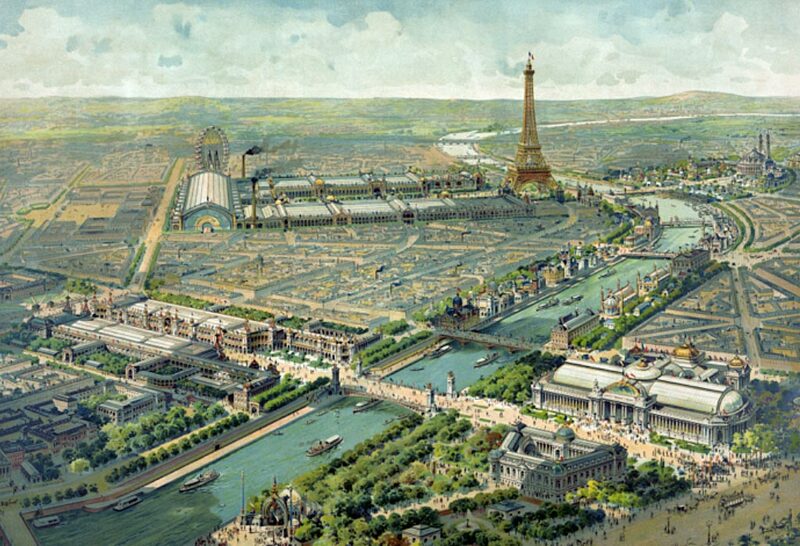 Whether the first “Great Exhibition” in the Crystal Palace in 1851, the “Exposition Universelle” in Paris, the Barcelona Universal Exposition of 1929, or the Lisbon Expo of 1998, international Expos have always had the humanistic ambition of creating a better urban quality of life. International Expos, such as the recent Shanghai Expo in 2010, give designers the opportunity to reach millions with their visions for the future, particularly as a catalyst for urban regeneration. In this Challenge, we focused on the idea of an Expo for the Paris Region, which would both present wider visions of an urban future, whilst providing a practical legacy of sustainable urban regeneration for the local area. Participants were invited to create an international Expo concept for the area, then design a pavilion, installation, an application or space which would inspire, excite and transform on an economic, social or cultural level. At the core of the Expo concept was the idea of “international”, bringing people together to create and share ideas across borders for the greater good of all. 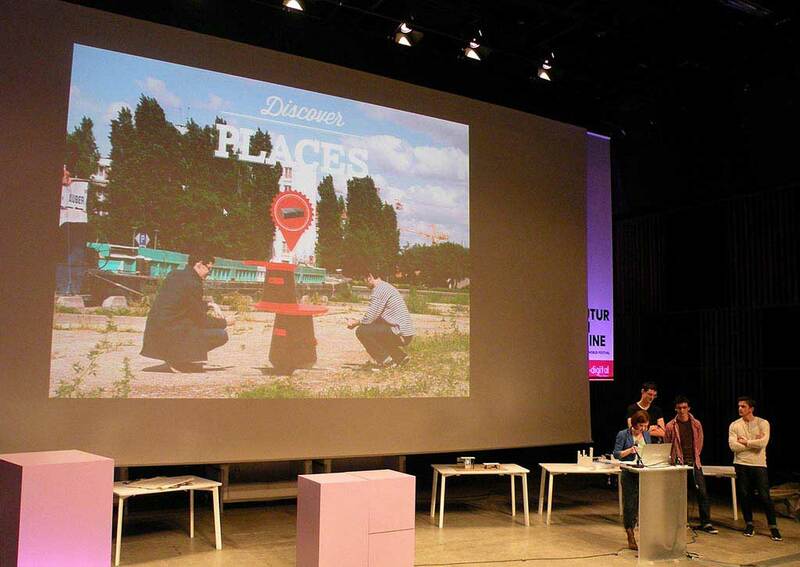 In this sense, the European Street Design Challenge 2013 brought together a broad range of international design teams from Paris, Ile de France, London, the Netherlands, Austria, Finland and Russia to develop, present and fuse their ideas for urban regeneration and progress. Given the large number of international teams, we needed an area which could be viewed immediately before or during the event. The participants in the past have stressed the importance of the “physical” contact with the area, walking around, even talking to the local residents. Given the time available, we have to stay relatively close to the 104. For that reason we decided to target the area, which we know well, focusing on the west side of La Plaine and over towards the Ourcq and Pantin. We have visited this area before. 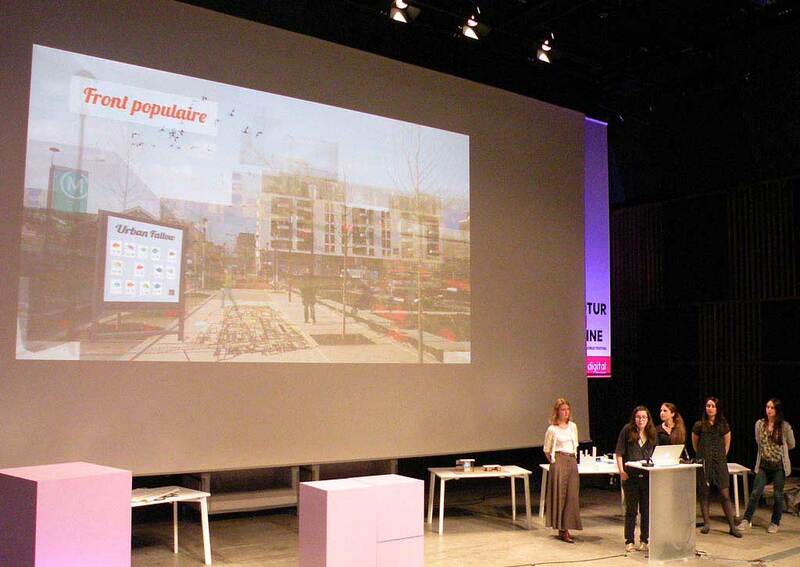 We then offer different perspectives for improving quality of life in this target area – from the regeneration of the former dense industrial space to the “opening” up of the Ourcq and its banks – for living, recreation, community building and better access…The resulting design solutions – applications, installations, spaces – can then “exhibit” innovative different perspectives for revitalising the area. From a geographical perspective, the target area represented ca. 3 sq. metres around Seine-Saint-Denis La Pleine, bordering Pantin in the west, Porte-de-la-Chapelle in the East, Boulevard Périphérique in the South, and the Stade de France in the North. In line with the conviction that increased international perspective heightens the innovation potential, this summer’s European Street Design Challenge features a broader selection of international and regional teams of creative SMEs, start-ups and students. 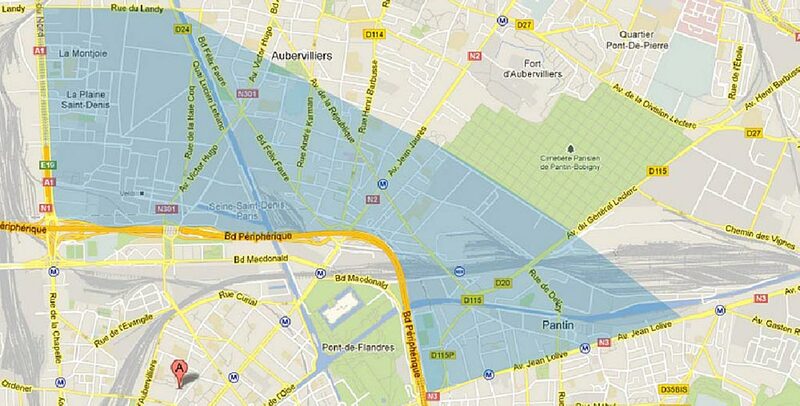 As in previous years, the Challenge demanded in-depth preparation around the target area for redesign in Saint Denis La Plaine, and around the area of the Ourcq canal. Also as in previous years, we were very fortunate to have been supported generously by the Region of Seine-Saine-Denis, and particularly Ouafae Benslimane, Ph.D – Chef de projet recherche, innovation Conseil général de la Seine-Saint-Denis, Direction de l’Aménagement et du Développement. 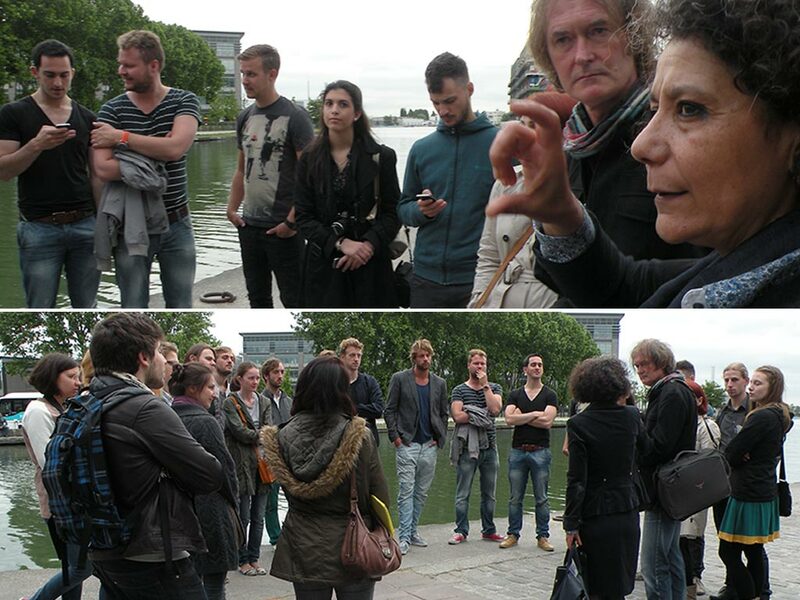 On the evening before the Challenge, Ouafae accompanied the participants on a visit to the banks of the Ourcq Canal, where she outlined in detail the plans of the region, local councils, public bodies and the “nine towns” for the sustainable development of the area surrounding the canal. This excellent introduction to this part of the project was followed immediately by the opening meal for the participants at Chez Clément on the Champs Elysées, generously sponsored by Crystal CG. The meal proved to be an important factor in developing the overall “team spirit” among the participants in this year’s Challenge. 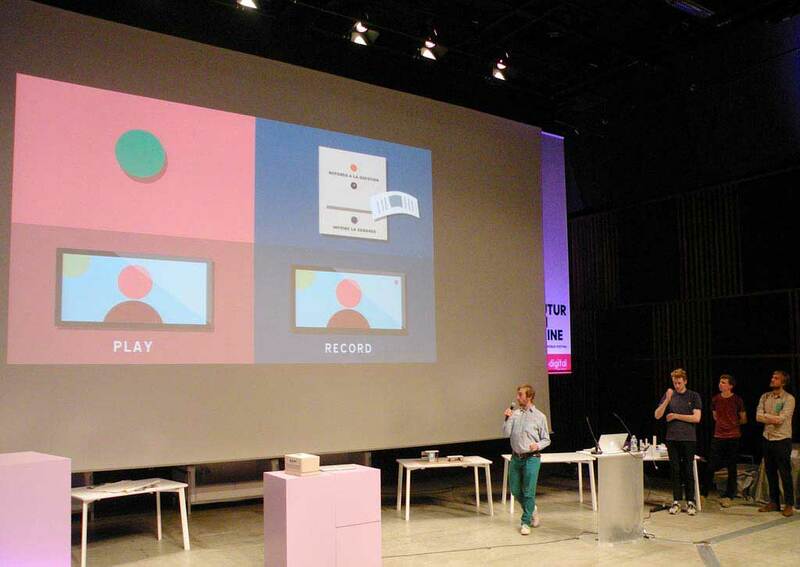 The Challenge started early on the first day of the Futur en Seine festival on Thursday, 13th June, at the CentQuatre, Center of Arts and Culture. At 9am, Andrew Bullen and Janine Huizenga once again presented the overall aims of Challenge, the Challenge target area, and the design brief. The whole group then left the 104 to visit the area of Seine-Saint-Denis. 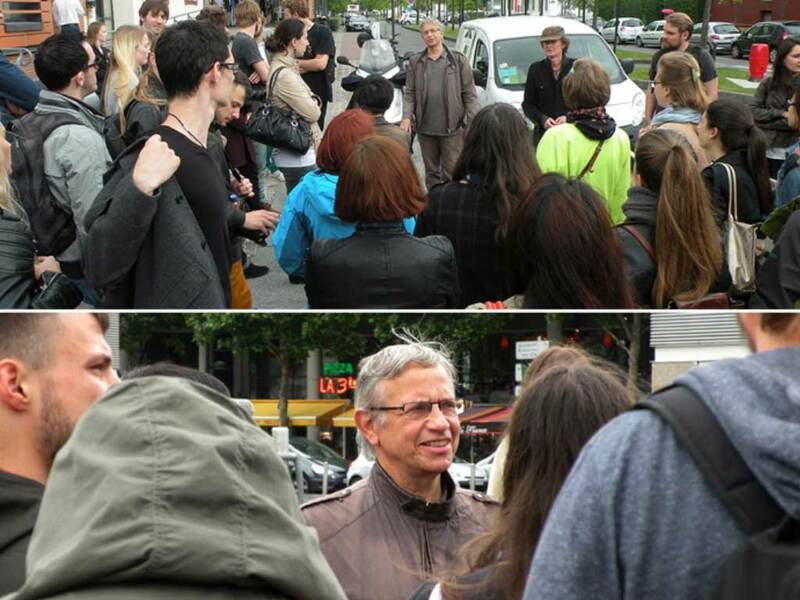 For the visit to Seine-Saint-Denis La Plaine, the Challenge participants were once again accompanied this year by Bernard Orantin, a local resident and keen historian of the area. The Challenge is very grateful to Bernard for once again giving his time, and providing essential local knowledge of the area. The Saint-Denis La Plaine area was once again approached via the navette on the Canal de Saint-Denis, which gives access to the new Millenaire Shopping Centre. There followed a extensive three hour “crossing” of the La Plaine area on foot: from the Chine wholesale quarter, via the new film studios and creative industries in the warehouses of the EMGP area, though the newly completed Place du Front Populaire, past the ongoing work on the Museum of the Science of Man in the rue des Fillettes, through the old factory area to the north of the Condorcet Campus, and passing through the old Spanish settlement, before finishing at the Stade de France. Bernard Orantin once again provided an excellent overview of the social history of the area and key points along the way. At the end of the tour, the participants returned to the CentQuatre to begin the brainstorming exercises, starting with Mental and Emotional Mapping. Participants were asked to make a mental and emotional of the area, focusing both on reconstructing the architectural topology of the area from memory and containing all relevant observations regarding emotions experienced while walking through the area. These observations were of a subjective nature, sensorial impressions like smell, sound, feelings of discomfort, happiness, etc. They first had to make their own, personal emotion map before the whole team had to get together to fuse all these separate maps into one, sharing an emotion map of the experience. Next followed the “Value Ladder” exercise, an essential part of linking the design process to group values. The participants were asked to define a set of five values that are important to him/her as a human being and as a designer, particularly in relation to the area which he/she is about to redesign. Starting with each participant having 5 core values, discussion then starts until all individual values are “filtered down” to only five values that are understood and accepted by the whole group. These values will be revisited by the teams throughout the challenge. They serve as a touch stone for their designs and they will have to be reflected in the final designs. Due to other commitments, the team from Strate could not participate in this part of the program. During this time, the teams were visited by Mr. Vicente Gonzalez Loscertales, Secretary General of the BIE, who shared his wealth of experience and knowledge in the Expo sector in a highly inspirational and motivating speech. 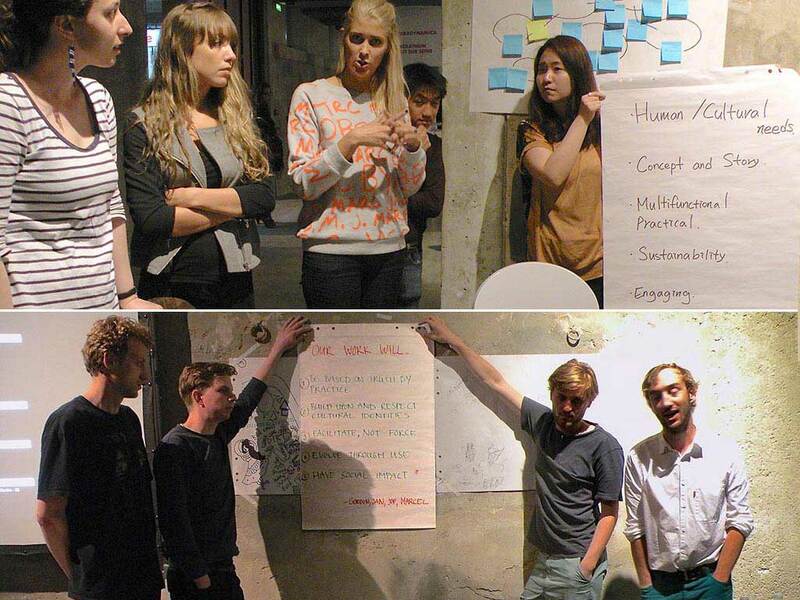 Before leaving in the evening for the official opening of the Futur en Seine festival, the teams were given the assignment of preparing an Appreciative Inquiry for presentation the next morning. The teams started the second day with an Appreciative Inquiry, an exercise made famous by David Cooperider. In this exercise, the teams explore and narrate experiences, places or events which have inspired them most and which can be applied to their present design task. After the appreciative inquiry, the teams continued the concept creation, design and build process of their prototype models and presentations. Discussion and feedback is essential for the iterative development procession, and the Challenge organisers were once again expertly supported by FabLab specialist Fiona van de Geijn. 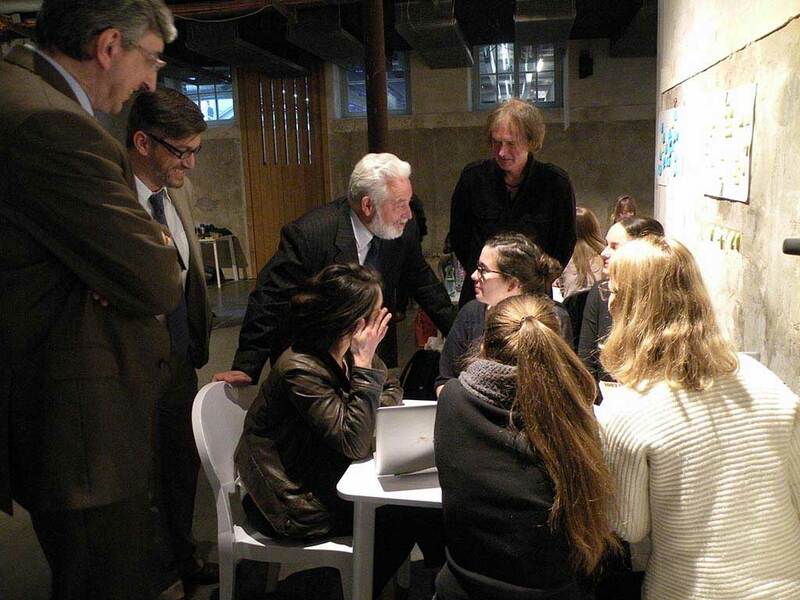 For the development process, participants had free use of the Universience Fab lab, situated at the Cité des Sciences in the nearby Parc de la Villette. At the end of the second day, the Challenge participants left the CentQuatre at around 9pm. Many of the teams continued working through the night in the hotel or at home. 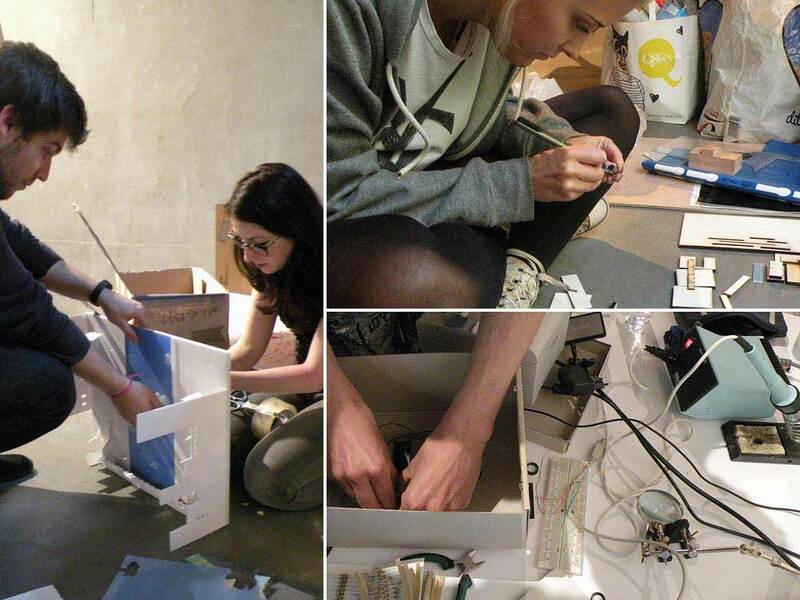 On the morning of the third and last day all teams worked hard to finish their prototypes and presentations. 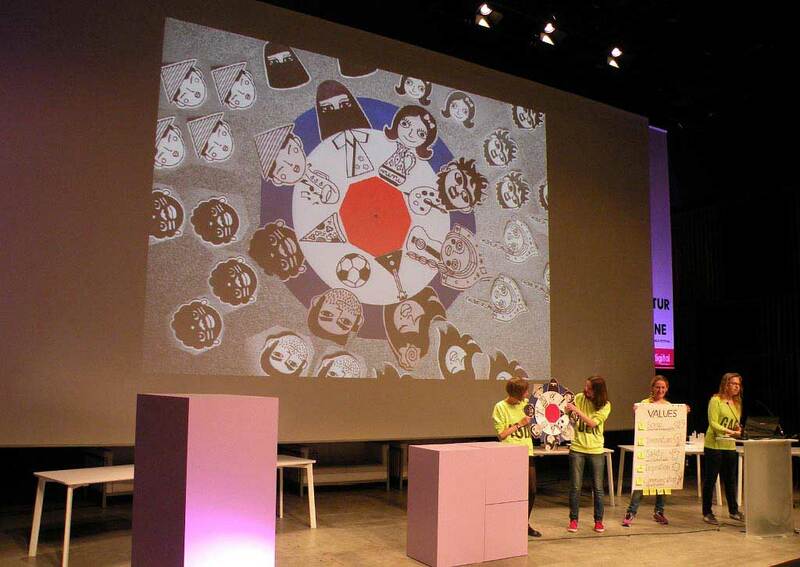 At 13:30, the final presentation of the team designs began in Salle 200. 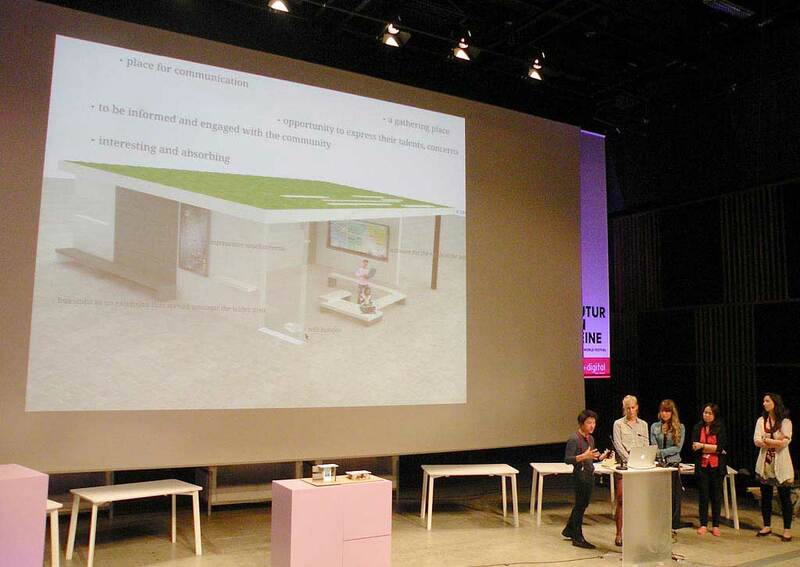 The design solution of the Afdeling Buitengewone Zaken team focused around a “box”, situated in various hubs, such as cafes or social clubs, to which outsiders could address questions about the area to locals via SMS. The answers would be videoed and made available to the public via a web-site. This idea was particularly valuable during the time of an expo to give visitors insight into the local social fabric of the area. 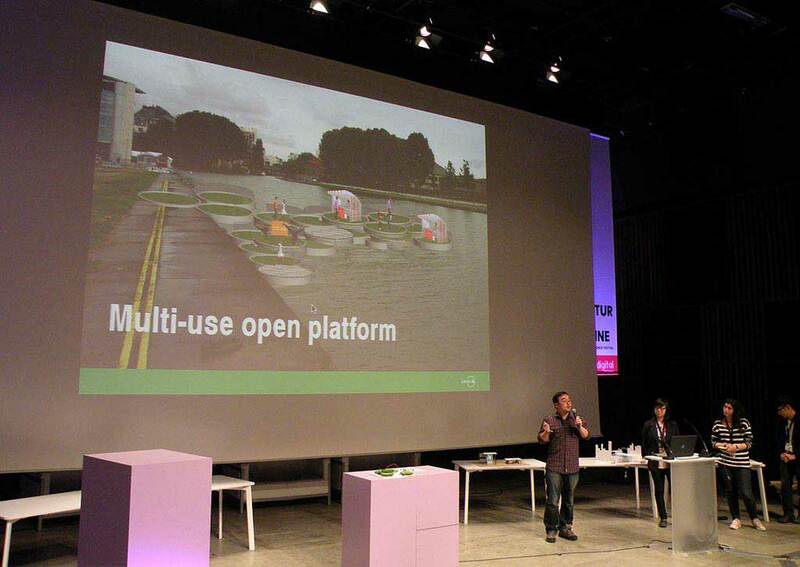 The Strate School of Design solution focused on small, modular floating platforms on the Ourcq, which could either be used on an individual basis, or connected together with other similar platforms for meetings or mass events. These flexible platforms, linking the two sides of the canal, could be adapted to the needs or wishes of the population. In addition, turbines in the water under the platforms could be used to create energy to power events or meetings. The platforms could be fitted with AR glass panels, which would provide a deeper insight into the narrative and environment of the area. Team École Boulle 1’s design was centred around a series of interactive “hotspots” – brick chimneys as a poignant reference to the area’s industrial past. Through the use of a mobile app, people could exchange messages, recipes, free concert tickets etc. The hub also presented the opportunity to physically meet other “like-minded” people who were also checking for new messages or information. Team École Boulle 2 designed an app, called “Urban Fallow”, where media objects, in the form of floating “fantasy leaves” – creating a digital layer on top of physical nature – could be “clicked” to reveal announcements of local cultural initiatives or information. Locals could spread these announcements throughout the city, and visitors could use the AR app to scan the area for interesting events. The SPb team noticed that the area was indeed multi-cultural, but at the same time fragmented, and the “unique” knowledge of the various communities was not shared. 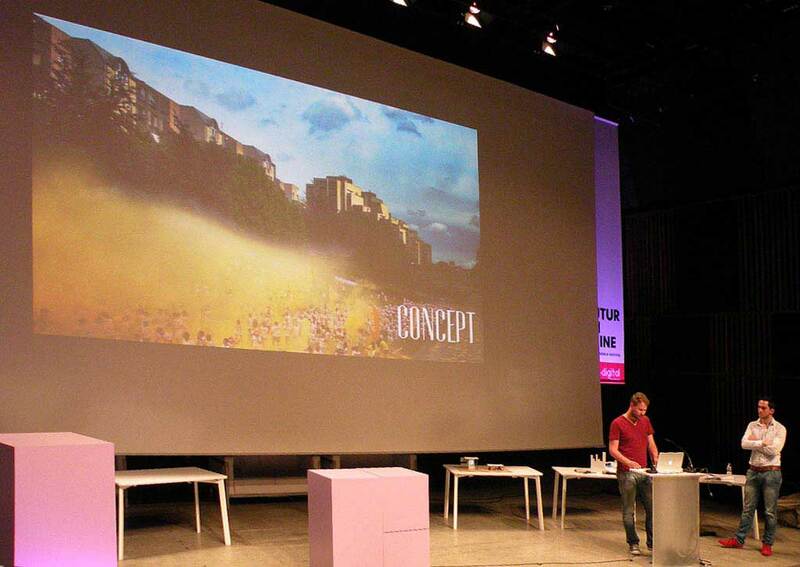 Their solution was to create an interactive reality TV show, using the TV studios already existing in the area. A “Wheel of Fortune” would connect people from the various cultural communities to use their entrepreneurial spirit, and specific cultural assets, to create a new business together. Television then becomes a kind of “buffer” facilitating the connection between the different social groups, highlighting positive features, promoting understanding and communication and inspiring others in the area to believe in their talent and potential. The striking design of the University of London team referred back to the first Universal Exhibition at Crystal Palace in London through the use of floating platforms in the form of giant “Victoria Amazonica” water lilies, which rested on the canal water. These floating platforms could be used individually or landscaped in a group. At night, they could be used as a “water feature”, lighting up the surrounding environment. 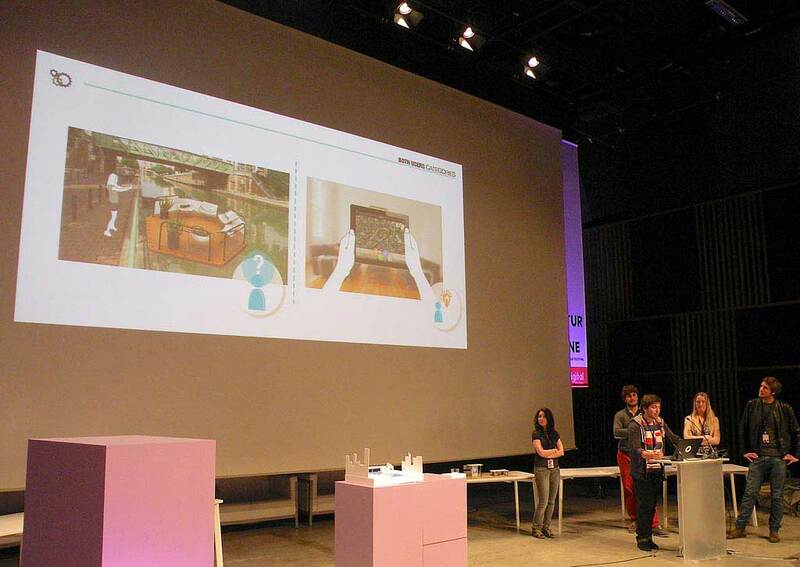 On the basis of the fact that water amplifies sound, the Linz team used the Canal de l’Ourcq’s water as a communications channel, connecting the two sides of the canal. People would speak into a tube on one side of the canal, their message would then be amplified by the water and received by “listeners” on the opposite canal bank – a very simple but highly effective idea! OiOi & ALA’s design referred back to the pub “La Tortue” which, until recently, had stood on the site of the present Place du Front Populaire, representing a popular meeting place for locals. 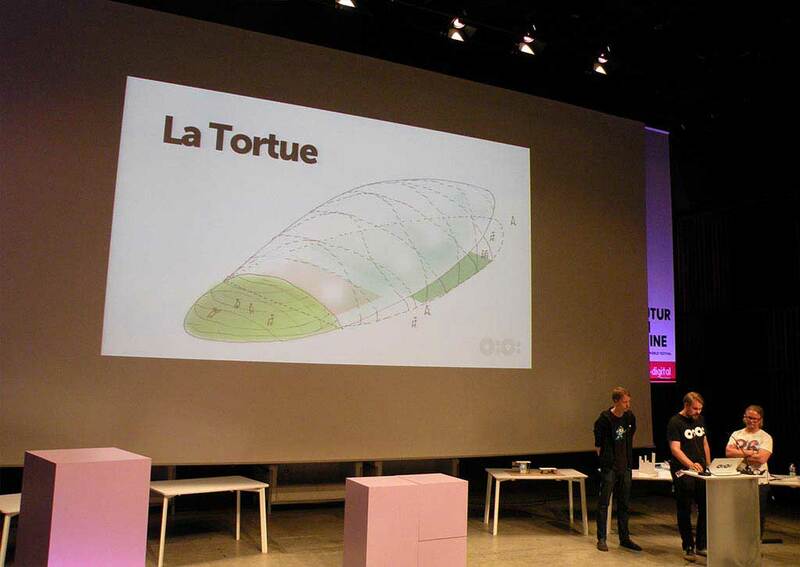 In order to make the Front Populaire once again a popular meeting place for residents, not just a transit space for commuters, the team designed a huge roof, in the form of a turtle shell which also contained an LED screen for interaction and gaming within the local community. Ravensbourne designed a multi-functional pavilion which would bring the community together for joint activities and communication. The pavilion contained a wide range of digital and physical devices and spaces, serving the human and cultural needs of the community, such as interactive touch screens, a message board for news bulletins and classifieds, metro timetables, maps, galleries, and a “speakers’ corner”. 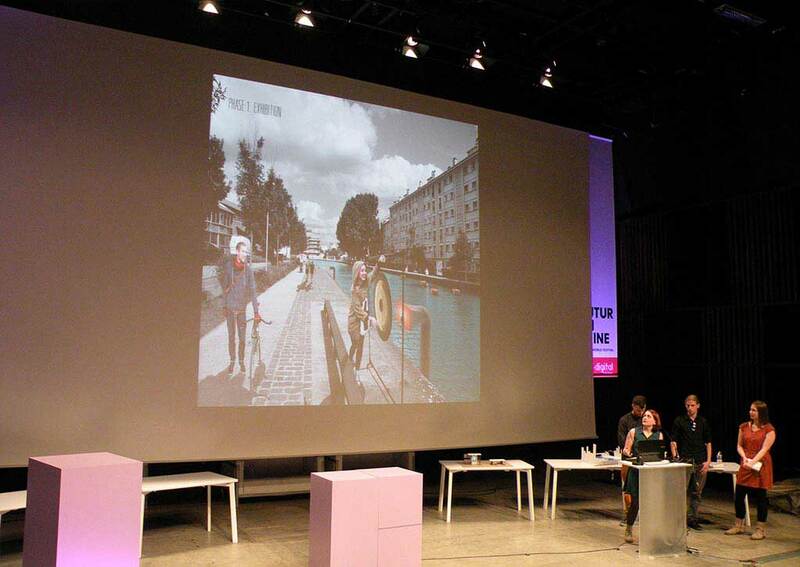 The Utrecht team had a radical solution for the Ourcq: to drain the water out of the canal at the time of an Expo! The resulting legacy would be a rich new space, joining not only both sides of the canal with each other, but also with the city of Paris, the “owner” of the former canal. The new “liberated” space could then be used as parkland for recreation, entertainment and a wide variety of events. The awards were presented on behalf of the BIE by Dr. Ivan Prostakov, on behalf of the Conseil Général of Seine-Saint-Denis by Dr. Ouafae Benslimane and on behalf of Crystal CG by Mr. Pascal Deseure.